It’s a great pleasure for me to introduce this evening’s performers, The Sorries, and its two constituent members, Martin Philip and Douglas Kay. As a long-standing member of the Club, and present Council member, Martin will be known to several of you already. Like a number of other Scott Club stalwarts, however, he has a tendency to hide his light under a bushel, and it was only recently at Council when discussing possibilities for this year’s programme that I discovered he was a live performer in a successful Scottish folk group. Martin also has an academic side, completing a PhD on the works of Allan Massie partly in the light of Scott in 2003, and teaching twentieth-century literature with the Open University and Scottish and English literature at the University of Edinburgh. He has published on James Robertson’s novels, and spoken to the Club in the past on Robertson and Scott. Douglas Kay, as Martin himself modestly puts it, is even more engaged on his musical projects and has toured extensively, with a number of fine albums to his credit and airplay on BBC Scotland. He is a qualified Primary school teacher, teaches part time, and tours around some of the schools in Edinburgh giving bodhran lessons to the children. The Sorries group was formed over ten years ago—their first live show was in Edinburgh in December 2006—and the title was chosen consciously to reflect an admiration for the Irish group The Corries. (Though not necessarily at a time of great consciousness on their own part, there being some uncertainty as to whether the decision was taken over a bottle whisky on the beach at Arisaig or Ullapool.) They now have a number of albums under their belt, and 2017 will see their ninth year at the Festival, with a run of daily performances at 4.30pm over three weeks at the Quaker Meeting House. Recently they have been advancing their interest in the tradition of Scottish song-writing, and have begun a series of podcasts (‘The Scottish Song Guide’) where they discuss the meanings and history of both words and music of some of the most famous pieces in their repertoire, interspersed with snippets from the songs themselves. 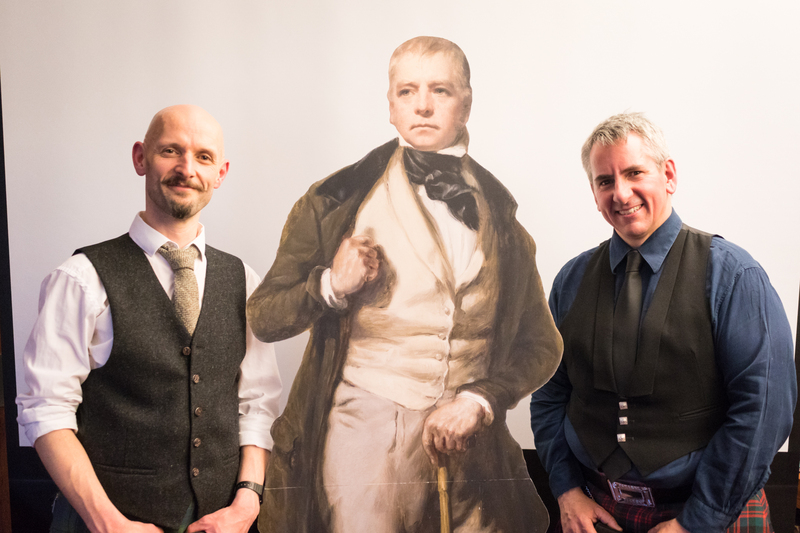 Something of this order I understand lies in wait for us tonight, focused on the songs of Walter Scott, whose output and significance in this field matches that of Burns and Hogg, though this sometimes tends to be obscured by the multifariousness of his other literary achievements. Just one more thing before we start, about the sound equipment here. This (needless to say) has been installed for us by Lee Simpson, using much of his own personal equipment in the process, and I think we need to acknowledge that without his unfailing and invaluable input it would not be possible for the Club to host (at least not so professionally) events such as this. Without further ado, Ladies and Gentlemen, The Sorries! !